The explosions went off at Farmers' Day event in Helmand's provincial capital that was attended by nearly 1,000 people. Two explosions went off inside a stadium hosting an agricultural show in southern Afghanistan killing four people and wounding 31, government officials said. 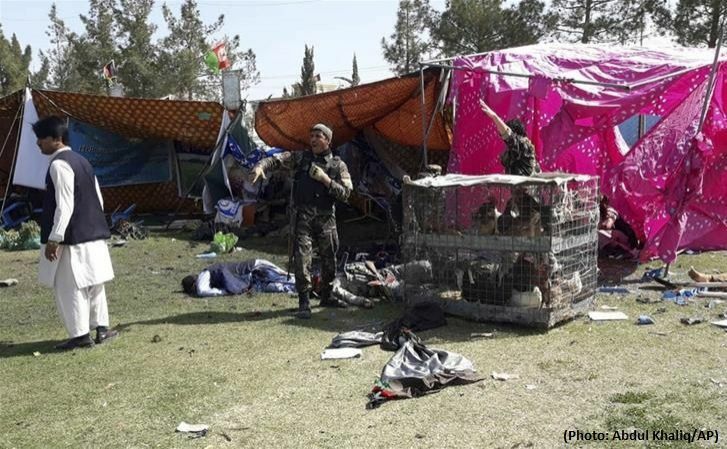 The blasts took place in Lashkar Gah, the capital of volatile Helmand province, as people marked Farmers' Day as part of Persian New Year celebrations, attended by nearly 1,000 people. Local Afghan news website TOLOnews reported that the provincial economic chief in Helmand, Mohammad Khan Nusrat, was killed in the attack. Helmand's governor was also at the staduim but was unhurt. The blasts appeared to have been caused by explosives placed in tents set up for farmers to display their products. \The Taliban claimed responsibility for the attack in a statement sent to media. It said the target was top Afghan officials, and claimed that no civilians were harmed in the blasts. Afghan President Mohammad Ashraf Ghani condemned the attack. "The terrorists are the enemies of peoples' bright future and development, they are attacking civilian installations, gatherings, and occasions to spread fear and horror, and to hide their defeats on the battlefront," Ghani said in a statement.